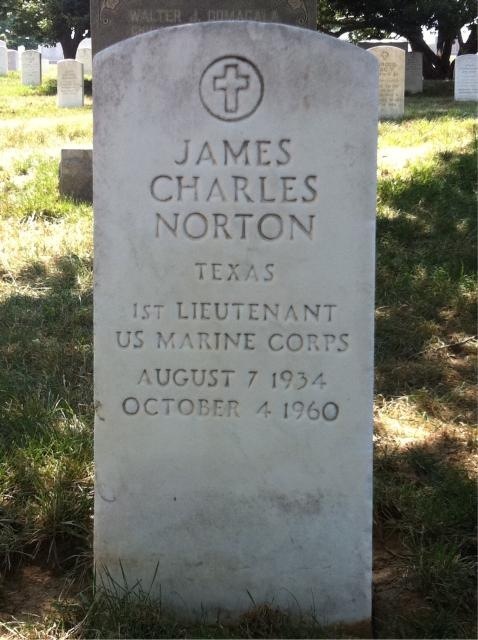 Sir, I am inquiring into the omission of Lieutenant James C. Norton's absence from the list of Marines who are buried in Arlington National Cemetery. Lieutenant Norton died while on a routine training flight on October 4, 1960. And was interred in Arlington. He was with VMF AW 531 based at Cherry Point, North Carolina. While I cannot find any record of the actual crash or details other than what his buddies had related to us. Nonetheless he died while in service to his country. Thank You and Semper Fi, Former Marine, Sergeant Kenneth W. Lewis, July 2008. Commissioned a Second Lieutenant in the United States Marine Corps after graduating from the United States Naval Academy (1957), Jimmy headed off to ‘The Basic School’ at Quantico, Virginia. While there, Jimmy met and, in August 1957, married Maudine Adcock, a fellow Texan. Jimmy had every intention of becoming an Infantry Officer; however, as he continued on in the program, he became increasingly enamored with the Aviation option. Accordingly, after completing the ten-month course of instruction at The Basic School in June 1958, Jimmy, Maudine, and Robert, born in May 1958, headed off to Pensacola for Jimmy to fulfill his new dream of becoming a Marine Aviator. After successful completion of flight training at Pensacola, Florida, Jimmy then continued further training at Beeville, Texas. While there Jimmy’s second son, Michael, was born in October of 1959. After completion of flight training at Beeville and upon earning his ‘Wings of Gold,’ Jimmy received orders to MCAS Cherry Point. Jimmy, Maudine, and their two sons headed east to North Carolina. At MCAS Cherry Point, Jimmy underwent further specialized flight training and qualification as a Marine Aviator and, more precisely, as a Marine Corp Fighter Pilot. First Lieutenant Norton was assigned to VMF(AW)-531, The Gray Ghost Squadron, when an unfortunate and tragic aircraft accident took his life on October 4th, 1960. The reasons why 1st Lt. Norton’s F4D-1 SkyRay Fighter crashed into the woods on the Carteret-Craven County boundary are still, to this day, unknown. Station authorities at MCAS Cherry Point stated that 1st Lt. Norton had reported no difficulty as he radioed the control tower at 1410 hrs. requesting permission to enter the landing pattern. His aircraft was one of four F4D-1 SkyRay Fighters returning from a routine ordinance training mission at Onslow Beach (Marine Corps Base Camp Lejeune), North Carolina. When Lieutenant Norton’s aircraft was approximately 5 miles southeast of MCAS Cherry Point it suddenly, and abruptly, broke away from the formation and descended, level-winged and in a perfect glide path, into the Croatan National Forest. With no radar image and no further contact from LieutenantLNorton, a Rescue Helicopter was dispatched to search the surrounding area. Two hours later, at approx. 1610 hrs. the Rescue Helicopter reported finding the wreckage of Lieutenant Norton’s aircraft some 4 miles south of MCAS Cherry Point and approximately 300 yards from Hwy 70. It was determined the Lieutenant Norton died instantaneously from the injuries sustained in this accident. Maudine and her sons remained in the Cherry Point area for a relatively short time, and then moved back to Texas -- near her parents’ home in Bonham. In 1963 she remarried, marrying Richard Carey, a Marine Corp Fighter Pilot who, in 1983, retired as an highly decorated Marine at the rank of Lieutenant General. Elder son, Robert Charles Norton (now Carey), a precocious young man, attended George Mason University at age sixteen, then transferred to North Texas State University. After graduation from NTSU in 1980, he was recruited into the Navy, where he served in the nuclear submarine force. He attended prototype school in Idaho Falls and was an instructor there for two and a half years. He served on USS Grant SSBN 631 for four years, before leaving the navy in 1988. He then applied his nuclear experience to the civilian world. He currently works in Arkansas at the nuclear power plant (Arkansas Nuclear One) in Russellville. Bob and his wife, Janet, have three children, Mindy, Tabitha, and Robert, and one grand-child, Gabriel. Jimmy's younger son, Michael Scott Norton, also attended North Texas State University in Denton, Texas, and afterwards entered into a career in the computer field. After becoming ‘disenchanted’ with the computer industry, Michael turned his energized personality and his love for the outdoors to the Transportation Industry was an Over-the-Road Truck Driver for 19 years, and still works in the trucking industry to this day. Michael has two sons, Joshua Cox and Tyler Norton, and two grand-children, Kylee Elizabeth Arndt, and Connor Cox. Jimmy was survived by his parents, Jack and Mary Norton (both now deceased); his wife, Maudine Eloise Carey; his children, Robert Carey and Michael Norton; and his Sister, Mary Diane Norton. Commissioned a Second Lieutenant in the Marine Corps at graduation from the United States Naval Academy, Jim headed off to The Basic School at Quantico, Virginia. While there, he met and, in August 1957, married Maudine, a fellow Texan. Jim intended to be an infantry officer, but as he continued on in the program, he became increasingly enamored with the aviation option. Accordingly, after completing the ten-month course of instruction at The Basic School in June, 1958, Jim, Maudine, and Robert (born May 1958) headed off to Pensacola to fulfill his dream of flying. He continued flight training at Beeville, Texas. Second son Michael was born during this latter period (1959). After completing flight training and earning his “Wings of Gold,” Jim received orders to Cherry Point, North Carolina. He, Maudine, and their two sons headed east, and Jim underwent further specialization and qualification as a Marine aviator. An unfortunate and tragic aircraft accident took Jim's life on 4 October 1960. Maudine and the boys remained in the Cherry Point area for a relatively short time, and then moved back to Texas -- near her parents’ home in Bonham. In 1963 she married Richard Carey, a Marine Corps officer, who eventually attained the rank of Lieutenant General. After Richard’s retirement from the Marine Corps in 1983, the Carey’s spent six years in Ohio, where General Carey served for Ohio Governor Celeste as Director, Alcohol and Drug Enforcement, and then was Director of the Columbus Airport. Upon their return to Texas in 1989, he served as the Dallas District Court Administrator for approximately five years. They are now keeping busy in retirement in Rockwall, Texas. First son, Robert Norton (now Carey), a precocious young man, attended George Mason University at age sixteen, but transferred to North Texas State University when military orders took his family back to Texas. After graduation from NTSU in 1980, he was recruited into the Navy, where he served in the nuclear submarine force. He attended prototype school in Idaho Falls and was an instructor there for two and a half years. He served on USS Grant SSBN 631 for four years, before leaving the navy in 1988. He then applied his nuclear experience to the civilian world. He currently works in Arkansas at a nuclear power plant (Arkansas Nuclear One) in Russellville. He and his wife, Janet, have three children, Mindy, Tabitha, and Robert. Jim's younger son, Michael Norton, attended North Texas State University in Denton, Texas, and then entered into a career in the computer field.